Getting into shape should be at the top of everyone’s to-do list. This ensures that we live longer, healthier, more productive lives and are able to accomplish all our goals. And, contrary to popular belief, you do not have to join an expensive gym to accomplish your fitness goals. You can create your own at-home gym and work out in the comfort and privacy of your own home. However, for this at-home gym to be successful, there are some things you must consider, including the flooring for your gym. This is a guide on picking a garage flooring to best suit your at-home gym. With a wide variety of styles, colors, materials, patterns and prices to choose from, finding the best home gym flooring should not be difficult. Before you even begin to think about the material for your gym floor, you need to understand what makes a gym floor “good”. Gyms are areas of heavy traffic and the flooring takes a bit of a beating sometimes due to the dragging of equipment and dropping weights. Therefore, a good gym floor is one that is durable and protects the sub-flooring. Good gym floors should not be slippery. There should be some amount of traction for safety purposes. Good gym floors should be laid perfectly without uneven joints or seams. Good gym floors absorb impact well and keep fallen objects such as weights grounded. If one happens to fall, gym floors should minimize the amount of injury suffered. Good gym floors are also aesthetically pleasing and encourages persons to work out. Good gym floors are also easily cleaned and won’t give off bad odors. Now that you know what makes a good gym floor, it is time to explore the various types of materials you can choose from. Rubber flooring is one of the most popular material for gym floors today. Not only is rubber versatile, but it protects sub flooring really well and reduces the wear and tear suffered by the equipment. Foam flooring a great, inexpensive option for persons who do light workouts such as yoga. 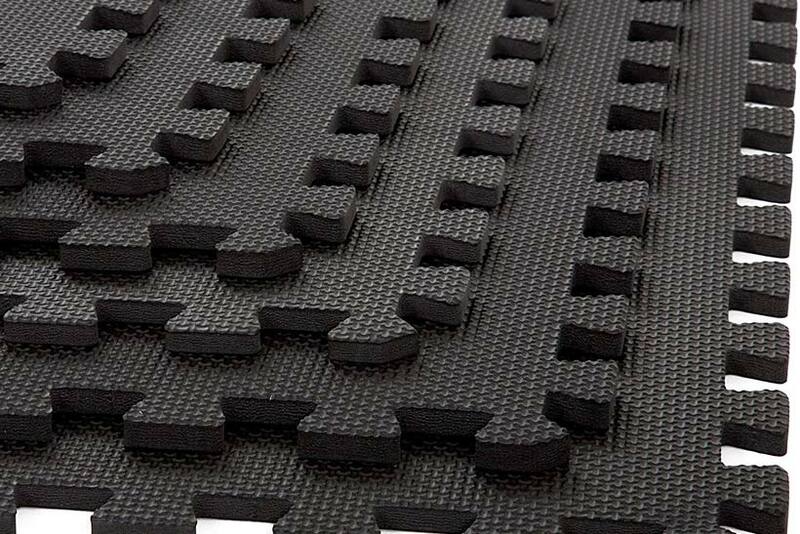 Foam gym flooring can come in many different shapes, colors and designs and is easy to source. Carpet flooring is already popular in homes and is a great flooring option for at home gyms. Carpet tiles are easy to install as there is no need of using a tile leveling system and are very comfortable. Another popular flooring option for at-home gyms is synthetic turf flooring. This type of flooring is extremely durable and is more suitable for heavy-duty equipment, high-intensity workouts and heavy traffic. Already a great option for garages, vinyl flooring is great for heavy-duty equipment and are highly durable. This type of flooring also comes in tiles and rolls and is pretty easy to install. The type of flooring you choose for your home gym should be dependent on the type of exercises you will be doing. You can choose between going to the store to select the best flooring, or shopping online. With a wide variety of styles, colors, materials, patterns and prices to choose from, finding the best home gym flooring should not be difficult.